Improvised stir-fry with chanterelles, carrots, tomato, beet greens and fresh banana peppers, with Thai basil, Shaoxing wine, soy, honey, a splash of fish sauce--surprisingly good. Lots of minced garlic and ginger sauteed in oiled wok first. 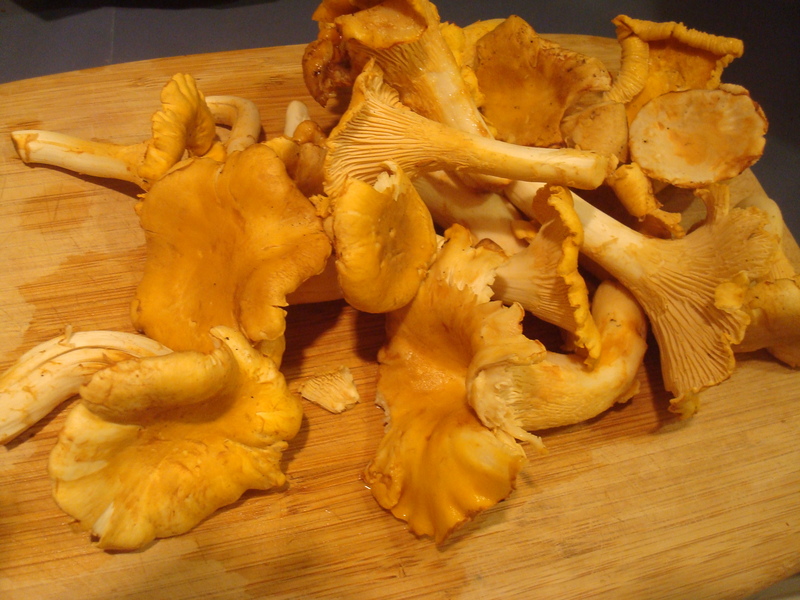 It's prime chanterelle season! The wet weather yielded a good harvest. One of the bright spots of fall! We’ve got such meaty fresh chanterelles at markets this season, I can’t find enough ways to use them. 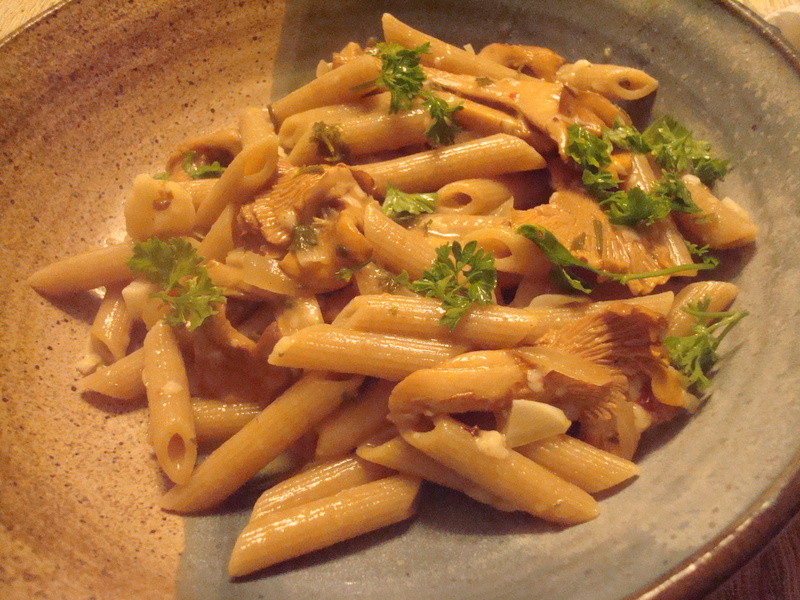 My default recipe is Ivy Manning’s whole wheat pasta with chanterelles, which always appeals. I’ll have to also check out this salad recipe of hers. Then we’ve topped pizza with sauteed chanterelles and slip them into tomato pasta sauce. But I’d never tried them in an Asian stir-fry, until tonight. Sauteed chanterelles cook down into velvety morsels with concentrated flavor. They’re so much more dense and complex than the shiitakes I usually use in stir-fry. For this impromptu dish, we began with hot peanut oil in the wok, in which we quick-fried some minced ginger in garlic. Then in went the cleaned and sliced chanterelles, then the carrots, then some salt, then after they fried a bit, some Shaoxing wine to deglaze the pan. Then we added chunks of a whole fresh tomato, which cooked down into a sauce, and fresh banana pepper and finally some wilted beet and turnip greens long neglected in the fridge. 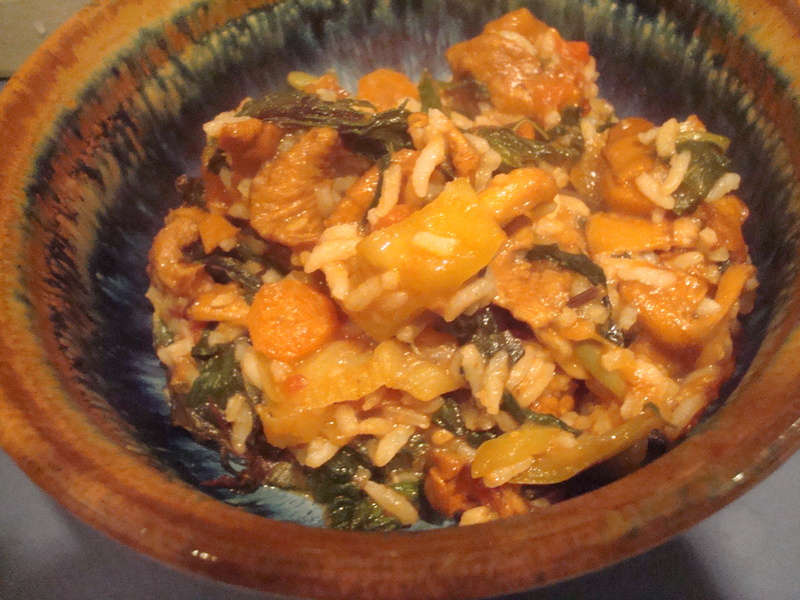 And pieces torn from a bunch of browning Thai basil, which reminded me to later add a splash of fish sauce. As it cooked, I splashed on a drop of sesame oil, light soy sauce and honey. Just before turning off the wok, we mixed in some day-old Basmatic rice. It was a Chinese-Thai fusion dish, which isn’t uncommon. At our local Thai restaurant, Dan likes to order “drunken noodles,” which is basically stir-fried broad-cut Chinese noodles or chao fan. Any other suggestions of what to do with chanterelles before this fleeting season runs out? I’d love to go foraging again sometime. But I’ve lost some motivation since they’ve been relatively inexpensive at the market, often less than $10 a pound. Ivy Manning's whole wheat pasta with chanterelles, from her beautiful Farm to Table cookbook. Well, thanks for the mention. I dig the riff you’re doing here, looks great! Hey Ivy! Als, can’t wait to try that raw butternut “rice” recipe: http://ivysfeast.blogspot.com/2010/10/labor-love-and-not-cooking.html. Looks fab. Glad to see you are blogging again. Hope to see you again soon. Have you done any good chanterelle foraging near PDX this fall?